The Arizona Board of Regents on Monday ended in-state tuition for Deferred Action for Childhood Arrivals (DACA) recipients after the state Supreme Court unanimously upheld a state appellate court decision, which held that DACA recipients in Maricopa County are ineligible for in-state tuition rates. Ridenour added that he felt the state’s unanimous 7-0 Supreme Court’s decision “is a setback for DACA students” and the board is hoping that Congress “will establish the lawful status and presence” of DACA recipients. 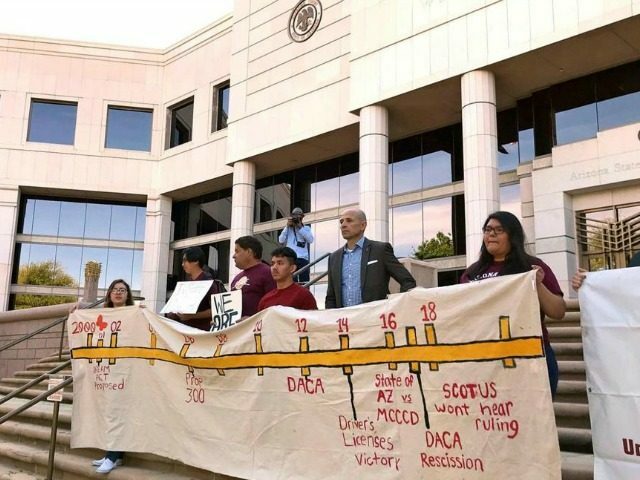 In 2015, a Maricopa County Superior Court ruled that a DACA recipient was eligible for in-state tuition rates, but the Arizona Court of Appeals court overturned that decision in 2017. According to the Arizona Republic, the state Supreme Court on Monday “issued a brief decision order saying justices unanimously agreed with the Arizona Court of Appeals’ ruling that said existing federal and state laws don’t allow the Maricopa Community Colleges to grant in-state tuition rates for DACA recipients.” A “full opinion further explaining the court’s ruling” will reportedly be released by May 14. More than 2,000 DACA recipients reportedly “currently attend community college or a state university in Arizona and pay in-state rates.” In-state students who attend Arizona State University, for instance, “pay $10,640 this year, while non-resident students pay $26,470. Residents pay $86 per credit hour at the Maricopa Community Colleges, compared with $241 for non-residents,” according to the Republic. Since 2015, DACA recipients in Arizona have paid in-state tuition at Maricopa Community Colleges, Northern Arizona University, Arizona State University, and the University of Arizona.